Our friends at JR Custom Metal Products, Inc. of Wichita, KS are featured in Powder Coated Tough magazine this month with our “flexible” alternative to power and free finishing system. Through extensive research that spanned over five years, the Martinez family learned everything they could about powder coating finishing lines before sealing the deal on an IntelliFinishing Complete Paint System with an in-line shot blast utilizing IntelliFinishing’s smart technology. Traditional paint systems are limited by line speed. IntelliFinishing load bars are based on part specific recipes with variable line speeds possible at any point in the system. Learn more about IntelliFinishing’s unique line speed here. 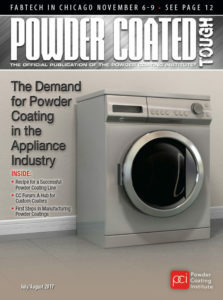 Read the Powder Coated Tough article here.